The Pacific War Online Encyclopedia: Lentaigne, Walter D.A. "Joe" Lentaigne was the son of a British judge in Burma and served for many years with a Gurkha regiment. His battalion was ordered to secure the west bank of the Sittang during the retreat from Moulmein and so escaped the debacle when the bridge was demolished with most of the rest of 17 Indian Division still on the east bank. He was later commended for his vigorous leadership in the retreat up the Irrawady Valley. Lentaigne commanded 111 Indian Brigade during the Chindit Operation THURSDAY. 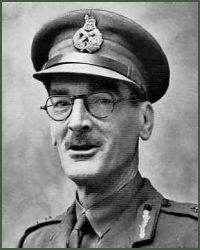 Although he was skeptical of Wingate's theory of Long Range Penetration, he was chosen to succeed Wingate in command of the Chindits after the latter's death in an aircraft crash, perhaps because he shared with Slim a background in commanding Gurkha units. He has been criticized for failing to stand up for the Chindits with Stilwell and for the decision to abandon the "White City" block in favor the the "Blackpool" stronghold, which was too close to the Japanese front lines and was quickly rendered untenable by artillery fire.